Last week on Urban Farmhouse’s blog she mentioned a friend’s barn sale that was going to be held on the weekend. BTW, if you haven’t been to the Urban Farmhouse store’s site you have to peek in. She has some very cute stuff in there. So I got up extra early on Friday and drove over to check it out. And. It. Was. Spectacular. The barn was located in the picturesque town of Granville, Ohio. On the drive there, as I got closer to the sale, they had signs pointing me in the right direction and each sign had a huge bouquet of dried hydrangea tied to it. That alone told me that I hadn’t made a wrong decision in driving all the way out here. Turning into the driveway of the beautiful old barn we were met by a man waving us in on horseback. As I stepped inside the barn I was transported to vintage heaven. 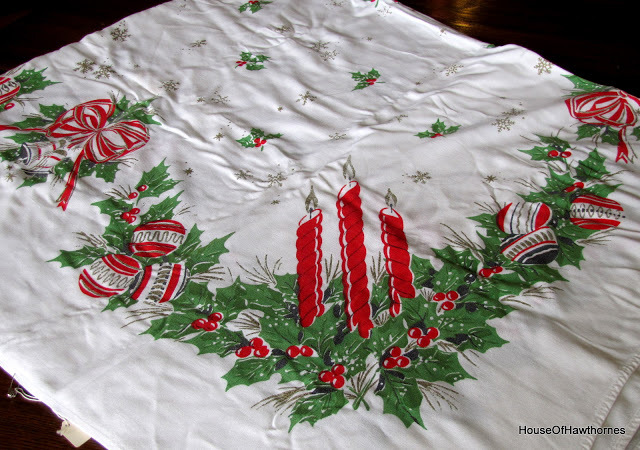 There were screen doors, silver platters, furniture, industrial looking baskets, skeleton keys, shiny brite ornaments, rolls of vintage wallpaper and more. Everywhere I looked there were more and more great finds. I could easily have bought just about everything in there, but I had to limit myself to just a few items. Christmas is coming up, so didn’t want to blow $500.00 in one shot (and on items just for me, me, me). This is part of what I bought. 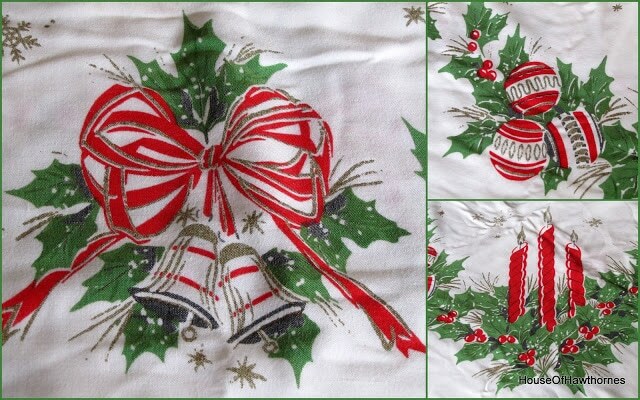 A vintage tablecloth for $5.00. It has fairly bright graphics on it so I can’t imagine it has been used more than once or twice. And this basket o’ Christmas. 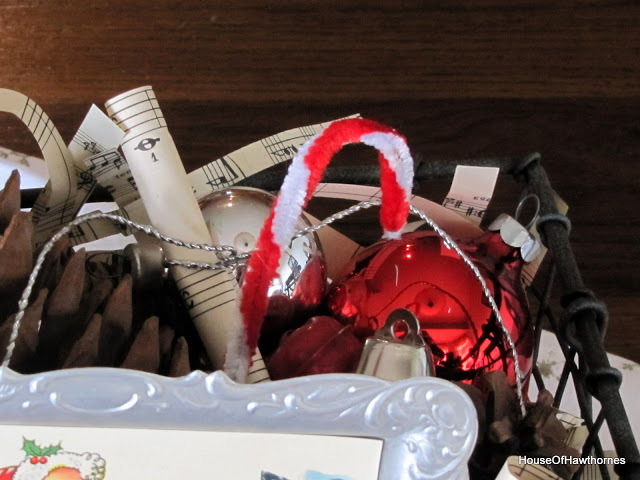 mini rolls of sheet music and a chenille candy cane. All in a vintage industrial looking basket. And it was only (cough, cough) $20.00. I will admit that I have had second thoughts about having bought this, because it is something I could so easily have made myself. But sometimes you need to just buy yourself something that makes you smile. And every time I look at this I grin! but it actually has the glass insert in it. I see these all the time at thrift stores and have never found one with the glass in it still (hence why I paid $15.00 rather than $1.91). It has some great detail on it. This will be sitting on the Thanksgiving table this year. Green beans and corn I think. 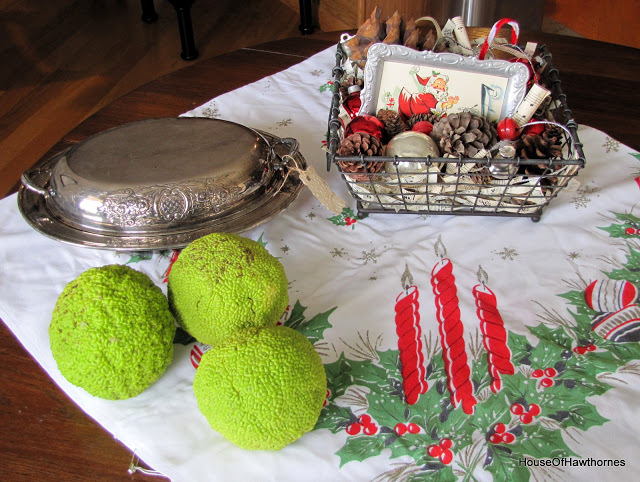 Oh, and these bright green hedge apples. I learned from another blogger that they are supposed to repel spiders and since I have a ton of spiders in the basement right now I just had to buy them. 3 for $1.00. And my absolutely favorite find of the entire day. 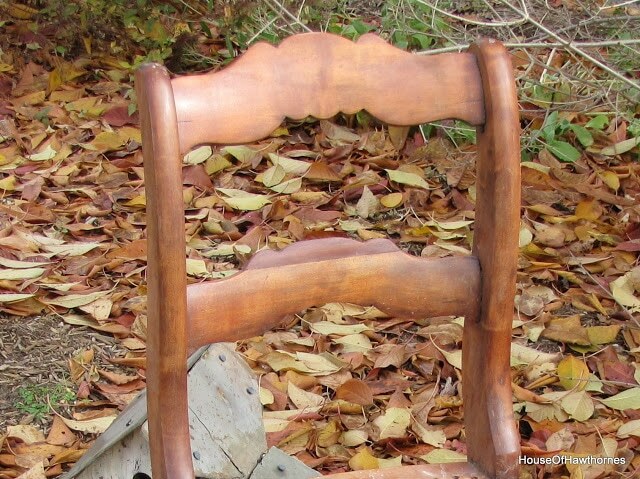 This $5.00 chair frame. They had a bunch of them hanging on pegs on the barn wall and for $5.00 I just had to take one home with me. It said “project chair” on the tag, but since I have enough projects awaiting me in the garage, I am going to hang this on the wall in my basement/family room. As is. And maybe the nicest part of the sale was when I left. At the door I was met by a nice older gentleman and a boy with a Kawasaki Mule utility vehicle type thing and they loaded my purchases up on the back and drove me down the hill to my car. It was just so darn cute! I mean you’re shopping out of a barn and they have all the amenities of Macy’s. Fantastic finds! I agree that sometimes you need to buy something just for you, that makes you smile. Love the little chair — what a deal! great finds! 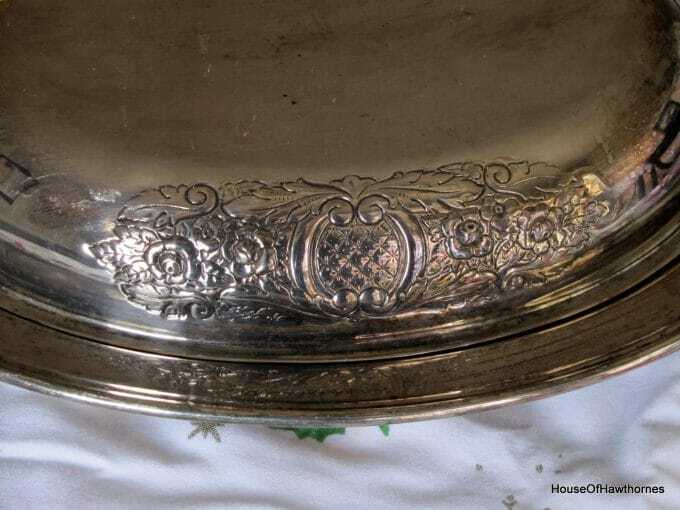 that chair is a fantastic project, and that silver dish is amazing! I have that same tablecloth. It was my mother’s and it brings back so many memories of my childhood. I use mine on my kitchen table. 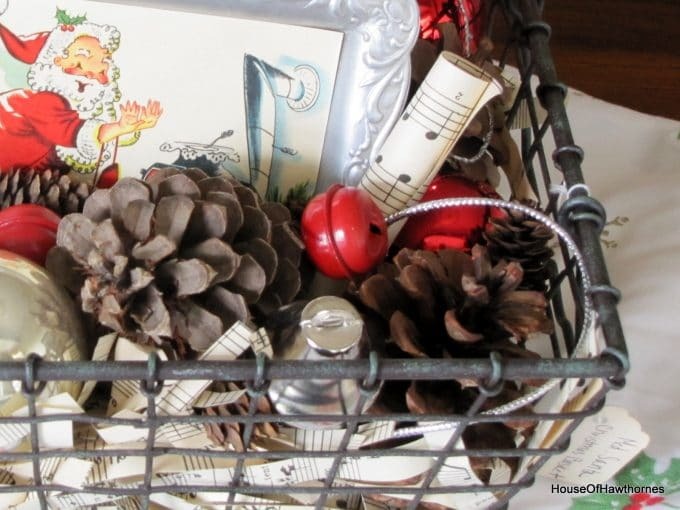 I absolutely love the basket with pine cones and sheet music…this would make a pretty Christmas gift. Thanks for the idea. 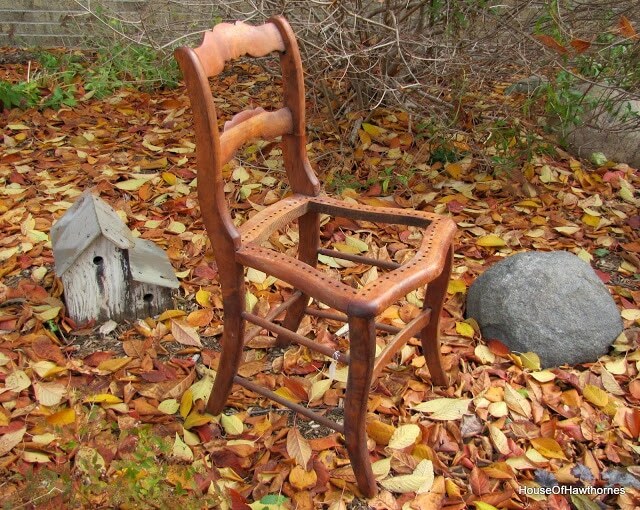 The chair is beautiful….I cant wait to see what you do with that. I live very close to that barn. I was there as well. The barn was so big and rustic. I loved the horses and the people riding and just going about their business. It was a beautiful landscape. I loved their items for sale. I love what you bought. Next week is the Urban Farmhouse Open House…….are you going? Barn sales are the best! You know I’m loving that Christmas basket with the shredded sheet music 🙂 Great texture and color of the hedge apples. Those are great for Thanksgiving and Christmas! Nice finds! Erin – He has no idea I bought this chair. I hid it in my office when I got home. Of course, when he reads this post he’ll find out. Oh well, I don’t complain about his ever increasing number of tools. OMG! You got some awesome finds! Love the silver. 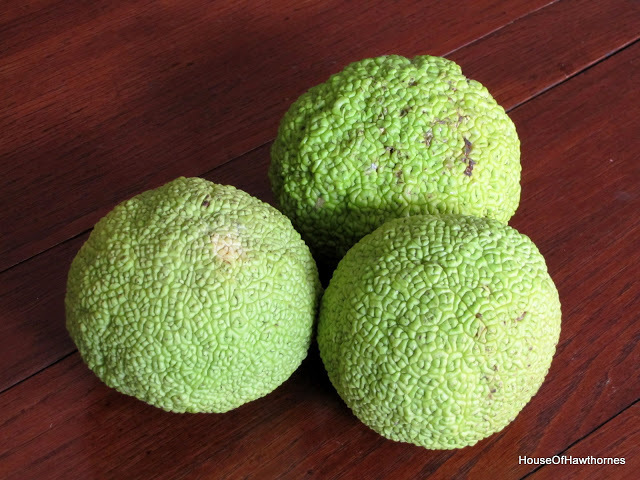 I’ve never seen hedge apples before. Can’t wait to see the chair up on the wall! 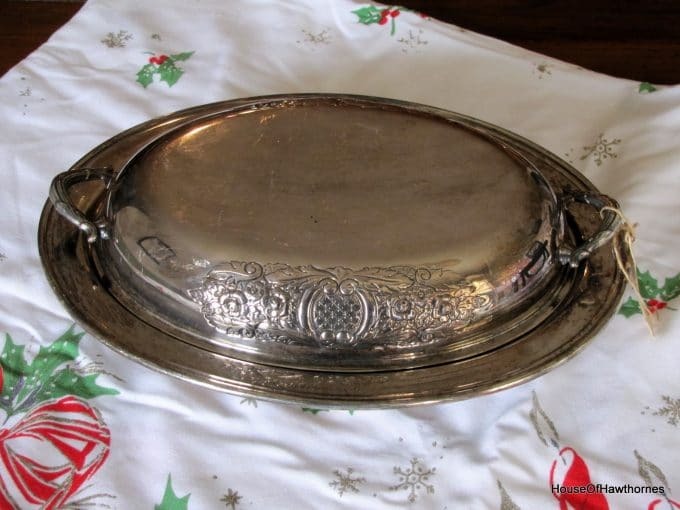 What a fun day, I love all your treasures exp that silver plate! Oh, what a wonderful sale! I just love barn sales and vintage heaven . . . I wish I could have been there! You have great finds. Tell me more about the hedge apples. I have never heard of them or seen them before. A great chair for $5. Wow, what great finds! Love that tablecloth. It is beautiful. Thanks for stopping by my blog and leaving a sweet comment. And yep, I did crochet that doily. Hope you stop by again. I love that vintage tablecloth. Amazing! Thanks for stopping by my blog, and for your sweet comment. I appreciate it. Oh, you lucky girl! 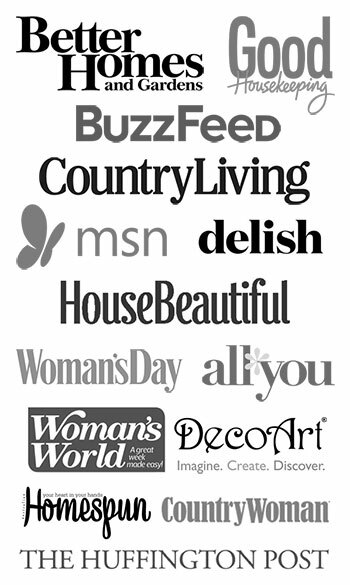 I am so envious of your purchases….and that you live where they have barn sales! I want to go to a barn sale! I would probably want to rip with wood off the barn though. 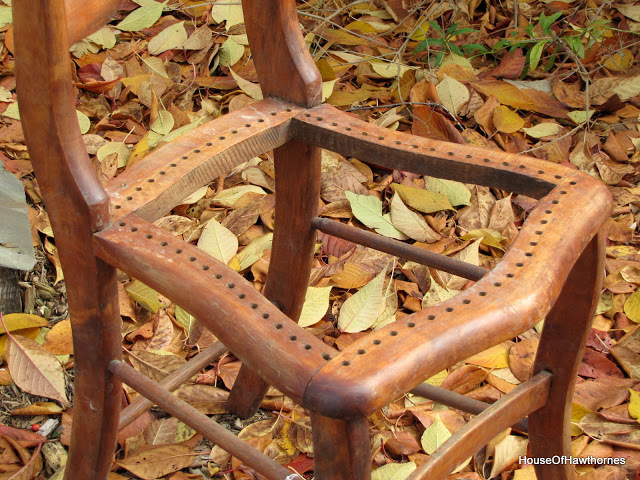 I love the wood on the old chair. You got some great stuff! It sounds like a fabulous Barn Sale! I wish they had something like this around here. Thank you for visiting my blog and saying such nice things about my studio! Oh Pam, thanks for sharing about this lovely day trip. I hope you took someone with you to share the experence. It sounds like soooo much fun. Thanks for visiting me at Nanniepannie’s today, have a good one. Pam thank you for joining again and I do understand! It has happened to me too. So happy to have you even though I knew you always were around. Thank you for your kind visit and words on the Marine Corps Birthday Ball. It was fun! Your finds are adorable. Love them all! So many great finds! 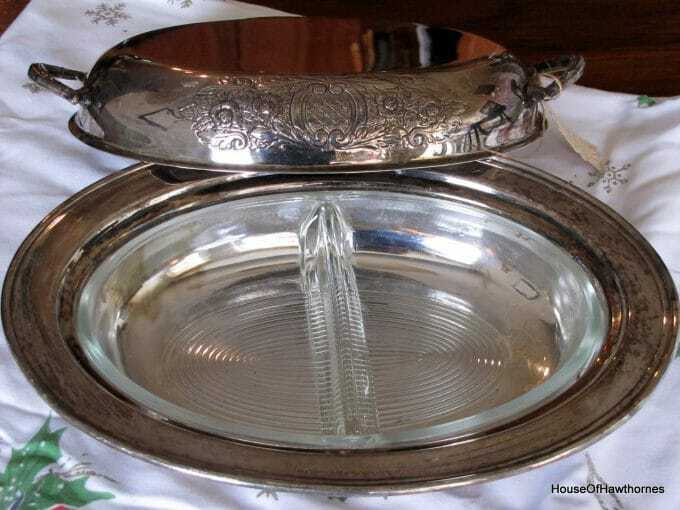 The silver dish with the glass insert it totally worth the price. Good buy! 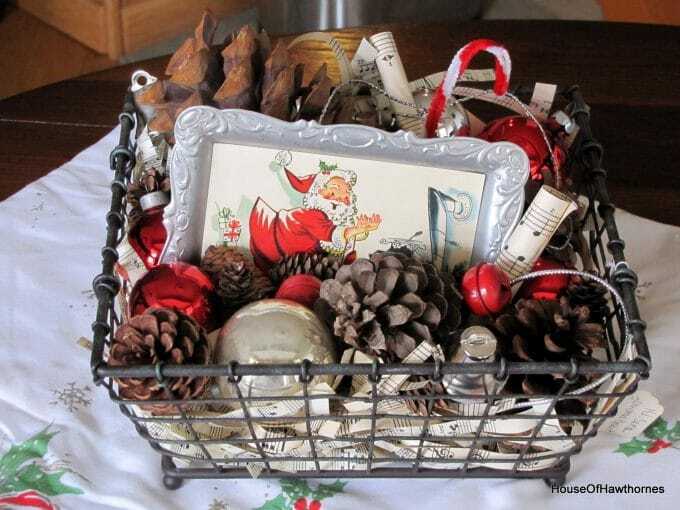 And so was the basket O Christmas if it makes you smile. I wish I was a little closer to that barn sale! Hi Pam, now that is a barn sale not to miss. 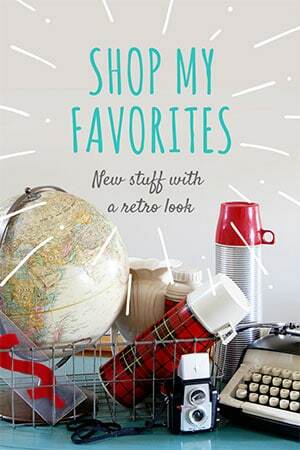 Great buys, lots of fun and treasures to love. Especially the chair. Lucky you. Hi, Pam! Oh, I would have LOVED to have been there with you for that sale! That veg dish you got was so pretty and that chair for $5? How lucky was that!